Download the first day results and second day schedule, see interim results and see registered teams and players. 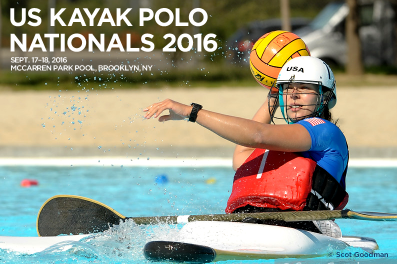 US Kayak Polo Nationals 2016 was hosted by NY Kayak Polo for the first time at the McCarren Park Pool in Brooklyn New York. September 17 through 18, was two days of intensive play and fun! We had two pitches in a large municipal pool, with warm-up areas on one end of the pool. The weather was good while the water was a little chilly! 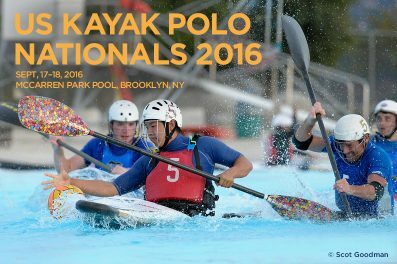 Download our Join us at US Kayak Polo Nationals 2016 and for more details see our US Kayak Polo Nationals 2016 Facebook page. Finding McCarren Park Pool – located at 776 Lorimer St, Brooklyn, NY 11222, between Bayard Street and Driggs Avenue, see on Google Maps. That’s the main entrance: go up the wide stairs from the street where you can walk in with yourself and your stuff. If you’ve got multiple boats to drop off, there is a service entrance at the back of the pool, on Leonard Street between Manhattan Avenue and Bayard. We’ll open the chain link fence and you can temporarily park in a small service area to unload. Parking near the pool – There is street parking all around, and it wouldn’t be surprising if you found a space pretty near the pool, especially early morning weekends. Check the parking regulation signs. There is also excellent free municipal parking right below the elevated highway (I-278 Brooklyn Queens Expressway) about 3 blocks south of the park. The street below the highway, Meeker, has free parking runs about 4 blocks between Union Avenue and Graham Avenue. Good potential place to park trailers. Also private parking lots within a few blocks (about $30/day). Area around pool is highly trafficked and usually pretty safe, but don’t leave stuff in your parked car! Public Transport – Closest subway is the G train, Nassau Avenue stop. Almost as close is G train, Metropolitan stop. From Manhattan you’re probably taking the L train – get off at either Bedford Ave (first stop in Brooklyn) or Lorimer (which also connects with G train, Metropolitan stop). All stations less than 10 mins walk from pool. There are hundreds of bars, restaurants, delis, gourmet food shops and specialty markets within walking distance. It would be hard to walk 5 blocks in any direction and not have a bunch of choices. For those interested, the main shopping streets are Bedford Avenue on the Williamsburg side of the park, and Metropolitan on the Greenpoint neighborhood side. Khim’s Milennium Market (460 Driggs), two blocks away, will probably have anything you need. Looking for billeting and offering billeting. All billeting requests made by September 6th have been accommodated. We will be in touch shortly with all who have made requests. Thank you to the many people who have volunteered to host visiting players! We will do our best to handle requests made after September 6th, we can’t make promises but please let us know if you are still looking for accomodations’. Open to teams wishing to play at the highest level. 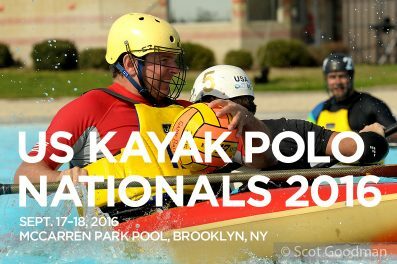 US and non-US club teams may enter, however, only US club teams are eligible for the title of US National Champion. Prior to commencement of competition, the competition committee will post the playoff format depending upon the total number of registrations. Pursuant to any such format, non-US club teams may be ineligible from the semifinals and/or finals. Open to all-female teams that meet the same eligibility requirements as for Division A. The same team placement rules as Division A for US National Champion also apply. Open to teams who meet the same eligibility requirements as for Division A but who feel they are not up to a standard of play to be competitive with the teams in Division A. The local organizing committee will let teams assess their own ability, but reserves the right to move a team up to Division A level if they are of an appropriate standard. Open to any team in which all players have a 21st birthday on or after January 1 of the current year, and who meet the same eligibility requirements as for Division A. Open to all teams and players. A US Club Team is one in which all competitors are US Citizens, Permanent Residents, or hold a current work or student visa for the US, and who meet the basic club membership criteria. Questions regarding players or teams meeting eligibility requirements should be referred to the USCPC. The USCPC reserves the right to declare a team a Non-US Club Team at any time for failure to conform to US Nationals rules. NOTE – All entries subject to organizers review. At least three entries in a division are required. We aim to maximize number of games for each team including (to the extent feasible) exhibition games for any teams ghosted from a finals game.